Those of you you who follow me on Twitter or know me in reality will know I have a mild obsession with finding the perfect laptop bag. Well last year I found that bag in the Rickshaw Bags Commuter 2.0. I’ve used and owned many, many laptop bags over the years, and so I feel I can say with authority that the Rickshaw Bags Commuter 2.0 is the perfect laptop bag. Yes you read that right – the perfect laptop bag. From its magnetic closures, to its removable laptop sleeve, to its array of pockets and pen hoops, to its quick adjust strap there isn’t anything I’d change on the Commuter 2.0. At least I thought there wasn’t, and then, one day recently, I found myself on the Rickshaw website, and saw their new Performance Tweed materials. When I ordered my Commuter 2.0 I went for a rather conservative all black appearance, but having seen the new tweeds I really rather fancy a bag finished in tweed; it appeals to my sense of Englishness. But which colour? I couldn’t decide between the Graphite and the Tuxedo, and having been recently stung by online colour matching issues I didn’t want to risk ordering a custom bag from the USA only for it to arrive and not be what I hoped for. I dropped Rickshaw Bags an short email explaining my problem, and asking if they were able to send me samples of the fabrics, at my cost of course. A few days later an Air Mail envelope arrived sealed with a Rickshaw Bags sticker, and containing both samples and some lovely, rather old school, cardboard tags identifying each sample. What fantastic service. I can’t recommend Rickshaw Bags products highly enough, and now I can say the same for their customer service also. Now if you’ll excuse me I’m off to order my new bag in Tuxedo tweed. I completely agree. I’ve had my Earl Grey Tweed Commuter since summer of 2011 and I love it, they sent me the color swatches in the mail too! When I got mine I didn’t like the binding color so they fixed it for no charge. They do have great customer service. Thanks for mentioning the tuxedo tweed too. 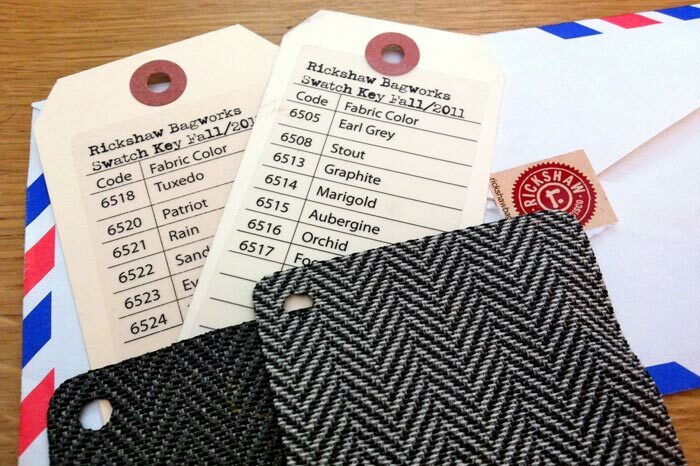 I didn’t realize there were new tweed colors, I think another purchase will be in my near future.